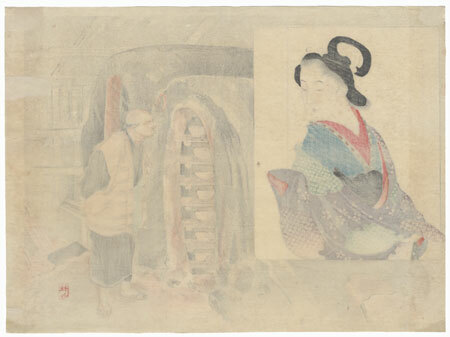 The Kuchi-e Tradition - Kuchi-e prints are woodblock frontispiece illustrations used in the publication of Japanese novels and magazines around the turn of the 20th century. 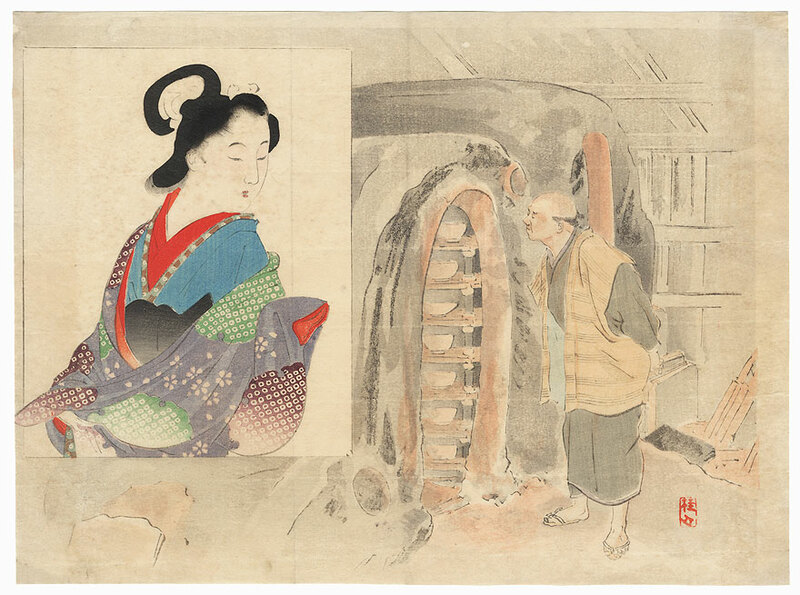 Most of kuchi-e prints were illustrations of bijin and continued the tradition of idealized beauties in Japanese art. The subjects, however, have a decidedly Meiji era feel about them and reflect the artistic movement towards more western design. Kuchi-e prints typcially have one or two vertical folds, because of their insertion in a magazine or book as an illustrative print. A previously neglected genre of Japanese woodblock art, much interest has been generated in the subject since the publication in 2000 of Helen Merritt and Nanako Yamada's groundbreaking book, "Woodblock Kuchi-e Prints: Reflections of Meiji Culture." Kuchi-e prints have become highly sought after and collected by the serious collector. Comments - Interesting kuchi-e print by Keishu that was the frontispiece for the literary magazine "Bungei Kurabu." The story is about a merchant named Wankyu whose love for the courtesan Matsuyama drives him to madness. 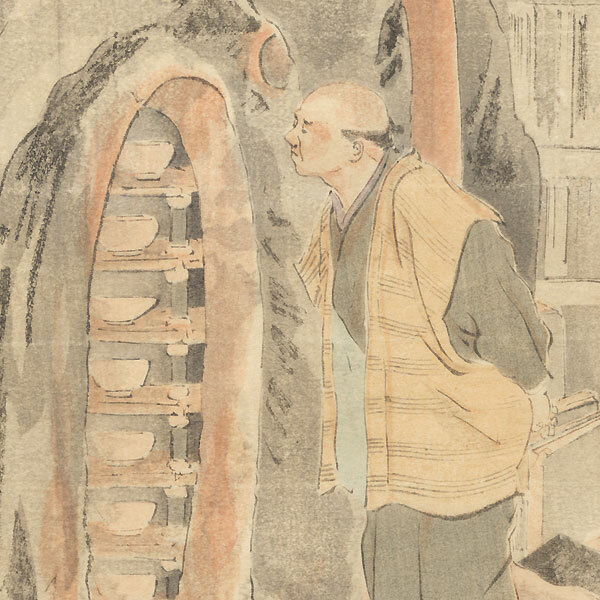 At right, a potter inspects a kiln while the inset at left shows a courtesan in colorful robes. Detailed with burnishing on the beauty's hair. An intriguing subject. Condition - This print with excellent color and detail as shown. Vertical folds. A few holes and thinning spots, small tear at edge, repaired. Slight toning and soiling, a few creases, spots. Please see photos for details.